Can we really be surprised that Rochester & Saskatchewan are going to a game 3 in the NLL Finals. They have combined for five of the last six Championships in the NLL. The RUSH have been heavy favorites all season, while the KNIGHTHAWKS have proven they can more than hold their own as they have won 3 of the 4 meetings between the two teams in 2018. All of that won’t matter in the winner take all game 3, Saturday in SASKATCHEWAN. When I made my preseason picks I had ROCHESTER picked last in the EAST. That didn’t work out too well! In 2017 they finished 7-11 and were dead last in goal scoring. CODY JAMIESON missed the entire year with a knee injury. There were big questions coming in about the future HOFer and his health coming into the 2018 season. JAMIESON was in the opening night lineup. He has responded mightily finishing 8th in NLL in scoring 26/63 89 points. Looking back you have to give the man credit for such a great rebound. He has led his young offensive group that is a lot different the squad that won 3 in a row between 2012-2014. The likes of AUSTIN SHANKS, KYLE JACKSON and JOSH CURRIER have stepped up in a big way. JOE RESETARITS has also contributed. None of these guys were on the roster the last time ROCHESTER took home the title. Back then they were rolling with KEOGH, DAWSON, POWLESS and POINT (what a wicked shot he had). CORY VITARELLI is a holdover. YYL DEFENSIVE PLAYER of the YEAR, GREAME HOSSACK and YYL GOALIE of the YEAR MATT VINC are leading the way for the KNIGHTHAWKS in the back. They can reclaim the title if they can come up with another big effort against the RUSH. They seemed to make the RUSH offense uncomfortable as they were settling for outside shots that VINC easily took care of. HOSSACK was on fire in game two scoring 2g/1a and picking up a game high 16 GBs and as always was all over the field. When I asked an anonymous NLL insider he was confident ROCHESTER would have a good chance if VINC could be the proverbial hot goalie, he was just that in game two making 47 saves. On the other hand SASK was my preseason pick coming into 2018. As the season has gone on, the KNIGHTHAWKS are the only team that has had success beating the RUSH. In the NHL playoffs it is often said your star players need to play like stars in the postseason. Well in game 2 that didn’t happen for the RUSH as MARK MATTHEWS was held goalless shooting 0/11 with 4a and ROBERT CHURCH (1/8 shooting, 2a) and BEN McINTOSH (1-13 with 3a) were held in check by the physical ROCHESTER defense. If those three shoot 2/33 again things won’t turn out well. I was a little surprised by the lack of compete level by the RUSH as well in game 2. They didn’t seem willing to take the extra step to get inside. The RUSH have been the best team all season and I will stay with my original selection, but ROCHESTER may have something to say about that! As the season is coming to a close and the excitement of SAN DIEGO & PHILLY coming into the NLL here are some more things I would love to see happen in the league. GAMING/DFS. With the recent Supreme Court decision that opens legal gambling this could be a great way to gain more exposure. Gambling laws are to be determined by the state. The NLL needs to get on board and be a part of all of the gaming that is coming. At the very least DAILY FANTASY SPORTS needs to happen ASAP. Getting on the DRAFTKINGS and FANDUEL platforms would lead to more interest in the NLL without question. Maybe I could make a little side cash too! The league is in a unique position with one of its teams that calls a casino home. Lacrosse at all levels need to engage the non lax person into the sport. Gaming is one way to do so. Long Island. Long term the N.Y. market is a must in my view. The NASSAU COLISEUM has been renovated and lacks a full time tenant. Wouldn’t the NLL be perfect for them? Not to mention the great local talent base on the ISLAND. Hopefully they will be in the next round of expansion. With SD and PHILLY coming on board that leaves us with eleven. Twelve would be a perfect number of teams. American Players. 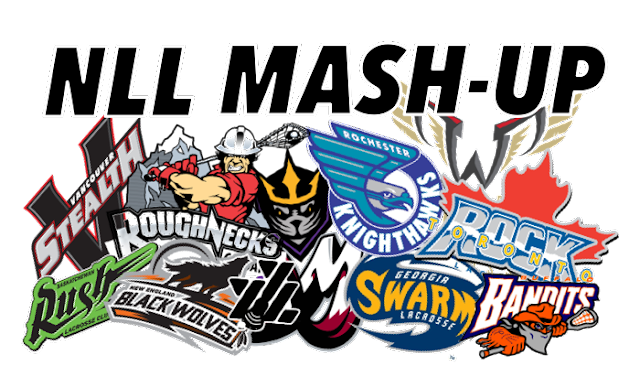 Quite simply there needs to be more Americans on NLL rosters, the new teams will give more opportunity to the AMERICAN player. But, the teams run predominately by CANANDIANS and they must also need to be willing to give AMERICAN players the chance. Two guys off the top of my head I would love to see in the box are DYLAN MOLLOY and MATT RAMBO. With there skill sets they would cause problems for NLL defenders, playing NLL would without question elevate their field games and give them more experience. At the end of the year when our world top 10 comes out most players will have NLL experience. Well now we can look forward to the draft as SD has won the right to make the first pick in the entry draft. PHILLY will have to settle for the first pick in the expansion draft. The league is going to look a lot different next season! Thanks for the time as always, interact with me on TWITTER, @bernasconirich. Also keep connected with @YUMYUMLAX for the best links and the most unique coverage!